Discussion in 'Android News' started by DroidModderX, Feb 6, 2017. The overwhelming consensus has been that the LG G6 will not release with the latest and greatest processor from Qualcomm, the Snapdragon 835. This is believed to be the case after it was reported that Samsung the company contracted to build the Snapdragon 835 had also bought out the first round of production of the chip for their upcoming Galaxy S8. If this is the case LG will have to hold off on releasing this phone until later in the year or release it with an older chipset. The Snapdragon 821 is the current top dog, but that chipset is aging and will certainly be a lesser performer when compared to the new Snapdragon 835. 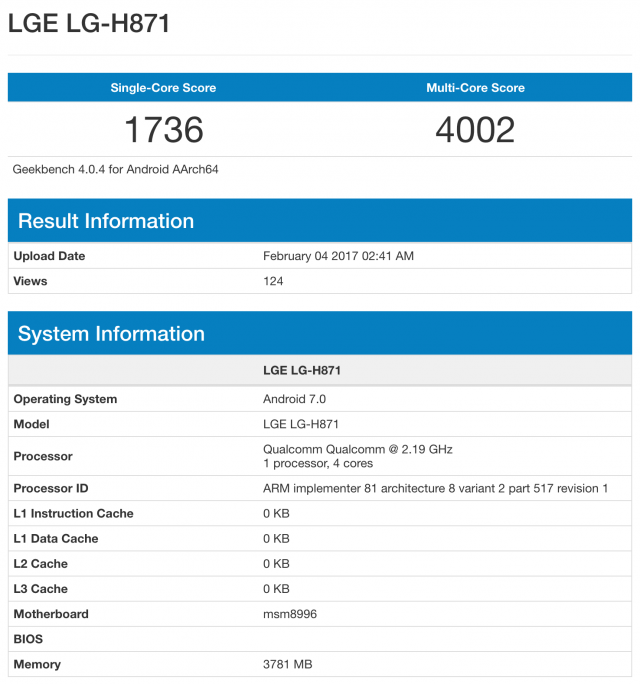 Earlier today a benchmark hit the web from a device labeled "LGE LG-H871". This model number doesn't belong to any released phone from LG. The benchmark shows a device that is running the Snapdragon 820 processor. The device is also running Android 7.0, and has 4GB of RAM. Who knows what device this actually is. It could be a midranger that LG is preparing for market or even a compact version of the LG G6. Would you be grabbing the LG G6 if it includes only a Snapdragon 820? Do you think it will make a difference in how well this device sells? I'm not convinced that specs sell devices so much anymore. It's what those specs translate into and look like.